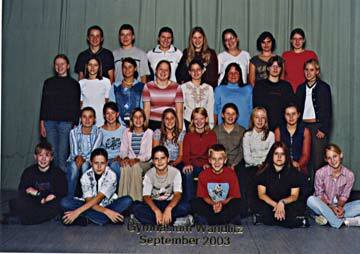 Gymnasium Wandlitz is a school in Wandlitz, Germany that specializes in languages and international studies. For the past two years, students have been sending articles to Silver International and one student has even come to visit Blair and Silver International staff members. This year the students have started a new class in which they study geography in English. The class is a special class that makes their school day a little longer than the school day for other Wandlitz students. In August, each of the students sent a few paragraphs about the class. We have selected a little from many of the students. I’m in the special English course because I think it’s really helpful. In form 1 we will have geography in English. I don’t know whether it will be very difficult or not. I like the English language very much, but I don’t like the monologs we sometimes have to do. I’m in the special English class. I chose this because I think it is important for communication with people from other countries. English is also a computer language. I know it will be hard but I want to try ! I’m in the special English course because in the 11th grade I want to go one year to the USA. In September we are going to London. Hi there! I’m in that course because I love English. That’s why I chose the Gymnasium Wandlitz and the course. To speak languages fluently is now very important. I think it’s a little bit hard because we’ve got two lessons more than the others. Sometimes it’s really depressing when the pupils all can go home and we’re practicing English. But that’s not so bad at all! I am in this class because I want to speak good English. To my mind English is an important language. Our English course has two lessons more. Sometimes it’s really strenuous but otherwise it’s ok.
I’m in the special English course because I want to learn more about the language and to speak more English than I’ve done before. And I like that we will drive on a class trip to London. In class 7th class we had six lessons, in class 8th we have five lessons and the other classes we have four lessons in one week. Sometimes it is very hard for me but otherwise I learn more. I liked the atmosphere in our class. We all are friends and the teacher likes us too. But sometimes the lessons are so boring. This course helps me with my experience in this language. I’ve had English since class five that’s why I’m sometimes sure in this language. I’m not super in English but I like it. I like that we had some special lessons where we looked at videos or read an English book or we looked at English news. But we write also more class tests than the other classes. That’s really hard. We read a book about London. I like it because it’s sometimes very funny. In September we go to London for one week. I’m in that class because I like the language. It’s quite easy for me to learn. And English is spoken all over the world. So I think it’s not bad to speak it well.